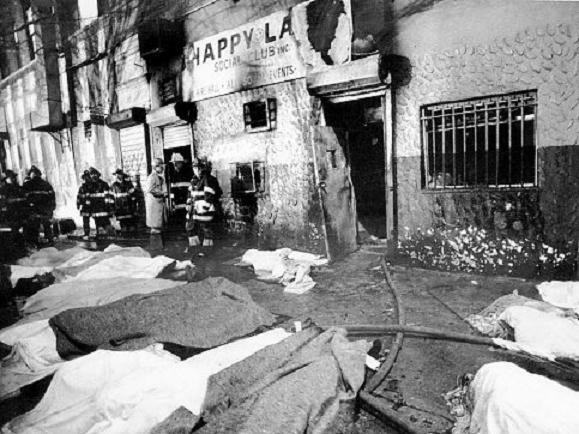 On this day in 1990, an argument turned into a mass murder at the Happy Land Social Club in the Bronx, NY. Earlier in the evening, Cuban immigrant Julio Gonzalez was ejected from the club after arguing with his ex-girlfriend, who worked there as a coat check girl. Gonzalez, who had recently lost his job, was enraged. He screamed threats at the bouncers as they ejected him from the club. Gonzalez returned to the club armed with a container of gasoline and some matches. He poured the gas on the stairs to the club and ignited it. The fire spread quickly. Due to a lack of working fire exits (they were blocked to prevent people from entering the club without paying), the people inside were trapped. Several managed to escape by breaking through a barrier that blocked one of the fire doors. Eighty-seven people died in the fire. Among those who survived was Gonzalez’s ex-girlfriend. She told police about the argument and Gonzalez’s threats. They tracked him down and arrested him the following afternoon. Shortly after being arrested, Gonzalez confessed to the crime. He was tried and convicted on 87 counts of arson and 87 counts of murder. He was sentenced to 25 years to life on each count. Since the crimes occurred in a single incident, New York State law required that the sentences be served concurrently, rather than consecutively. Gonzalez is currently incarcerated at Clinton Correction Facility. He is scheduled for a parole hearing in November 2016. The owners of the building were sued by the victims and the families of the deceased. The case was settled for $15.8 million, divided between the plaintiffs.